He became friends with Matija Čop, another Slovenian from Žirovnica, while still in Vienna (1797-1835). 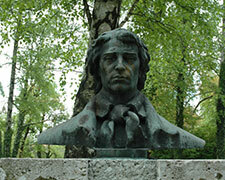 Their acquaintance deepened further in Ljubljana and led to Prešeren starting to take his poetry more seriously. It was through Čop’s encouragement that Prešeren started publishing his poems in Kranjska č’belica (The Carniolan Bee), a magazine established in 1830. During this time Prešeren and Čop were fighting the battle for the use of Slovenian Language in literature, known as the Alphabet War (Der slowenische ABC Krieg). In 1833 he met Julija Primic (1816-1864) in the Trnovo church, who greatly influenced his future poetry writing and also, partly, his life. He dedicated several of his poems to her, the most famous among them the 1834 “Wreath of Sonnets” (“Sonetni venec”), “Gazelles” (“Gazele”), “Doctor” (“Dohtar”), “Many a Pilgrim goes to Rome” (“Mars`ktéri romar gre v Rim”), “He Knew Not the Prayer, The Thick-headed Nobleman” (“Ni znal molitve žlahtnič trde glave”), “In Happy Times Passed the Year” (“Je od vesel`ga časa teklo leto”), and others. She later married Prešeren’s schoolmate Jožef Anzelm pl. Scheuchenstuel.